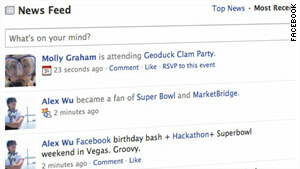 Facebook's "news feed" patent could set up legal fights with Twitter and other networking sites. In 2006, Facebook users revolted when news feeds started, calling them "stalkerish"
(CNET) -- Facebook this week was awarded a patent pertaining to streaming "feed" technology -- more specifically, "dynamically providing a news feed about a user of a social network," complementing another patent filing that has been published but not yet approved. Twitter, as AllFacebook points out, is effectively one giant news feed, to the extent that it clearly has influenced some of the changes that Facebook made to its own feed technology. That reaction could be alarmist. And yet prominent figures elsewhere in the social-media world don't seem thrilled. "There goes the neighborhood," quipped Chris Messina, an open-standards advocate who recently joined Google as a member of its new Social Web Team, on Twitter. "Can I start screaming loudly about patent reform now?" tweeted Matt Galligan, who founded a streaming-feeds start-up called Socialthing and eventually sold it to AOL. Indeed, technologies that now may be technically encompassed by Facebook's patent are so widespread on the Web that they're more or less inextricable from the basic tenets of social media. We'll probably be hearing more about this patent and how it changes the industry before long. How times do change: When the "news feed" first launched in the fall of 2006, members revolted in one of the first instances of large-scale Facebook user outrage. They denounced it as "stalkerish" and disapproved of what they saw as a lack of privacy controls. Facebook founder Mark Zuckerberg ultimately posted an apology note to the company blog in response.